True story: I went to an arts-related grants function yesterday at a brand new performing arts center. Brand new meaning built from the ground up in the Year of Our Lord 2008, the 18th Year of the Americans with Disabilities Act. The director climbed up the four steps to the stage, welcomed everybody, and made a pitch for organizations to rent her space. Perfect acoustics. Sprung floor stage. Reasonable rental rates. Because, you know, We won’t ever need access. That’s just for Them. Ugh! This kind of belief is so commonplace. That’s so disappointing to have a new space that a wheelchair user can’t fully access. Our elementary school stage now has a lift–there are some students who are wheelchair users now. I used to be US, walking around oblivious yet compassionate to THEIR difficulties. I’d think, THEY should have access. But I did nothing about it. Now I am THEM. I feel the frustration, the barriers, the dependence. I try to be understanding to US but now I take many opportunities to inform US where the shortfalls are in the community. I recently had to tell my son my PIN code to my bank card so he could enter it for me. I had a cart of groceries and the PIN pad was fixed so I couldn’t see the #’s. After the purchase, I informed the store manager of the inaccessibility and politely told him I would not be shopping there again until it was fixed. We’ll see what happens next. That is so frustrating. The place it annoys me most is church. I’ve not sang in the choir in church in years because I can’t navigate the stairs. I’m sorry, but there are people who perform who also happen to be disabled. jerks. I really liked the example of the stage because more and more people I know want to stop living in silence. The days of shuffling off behind the veil are over and yet, as you point out, that’s still them and not us. No, not us. I would laugh but for crying. How to break that thinking is very difficult since in our culture we do not yet see those with disabilities/impairments as equal human beings, whose opinions and concerns are equal, whose potential and life are equal to the ‘ourselves’ of the able bodied. meh: if you have the energy, call your church leadership out on the choir situation. 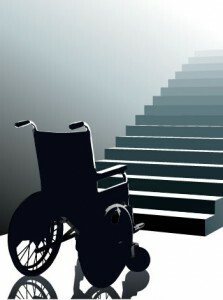 Pretty much every denomination has some sort of religion and disability office at the national level that can help you with materials and resources to raise the consciousness of your leadership. Elizabeth: yeah, the stage does evoke another dimension – we are actors, not just passive receivers in life. Thank you for pointing that out. weeble: good for you! I hope that store decides to install a different mechanism for their card machines; it’s not like they don’t exist. fridawrites: it’s just so sad how so many things have to be retrofitted because it didn’t occur to someone when it was originally built – when it would have cost practically NOTHING! The ADA requirements are there and it’s law. I understand it might not be tactful to report it first before asking them about it. But damn, some things need a swift punch to the gut before they start moving. This type of attitude has always annoyed me! A ot of people don’t even consider the fact that accessible spaces are easier for everyone to navigate disabled or not. That’s besides the fact that “non-disabled” people are only really “temporarily able-bodied”. They will grow old or become disabled themselves one day and need the access themselves. Katja, I hope you don’t mind this example… I feel a little sheepish sharing it, but oh well. My eldest child was born by emergency cesarean, and it was a really rough (and long) recovery. My mobility and strength were greatly reduced during that period. It was then that I think I gained a much better perspective on exactly what your previous commenter said… accessibility makes things easier for everyone. There are doors that are ridiculously narrow and heavy, there are stairs that block access, there are routes into buildings that don’t make sense. And on and on. The us vs. them thing is idiotic, as is the presumption that stages don’t need to be accessible. No need to be sheepish at all, Extra Super – that’s exactly the point! There is no magic binary division between “able-bodied” and “disabled”. It’s a continuum. Building accessibly has had all kinds of serendipitous benefits to all sorts of populations the designers didn’t think about. Let me tell you that every time a big appliance or large package has been delivered to my house, the delivery guy has been overjoyed to use my ramp. Every parent/caregiver using a stroller appreciates ramps as well. Everybody whose hands are full likes being able to press a button to open a door rather than wrestling with doors and packages. That list goes on and on.